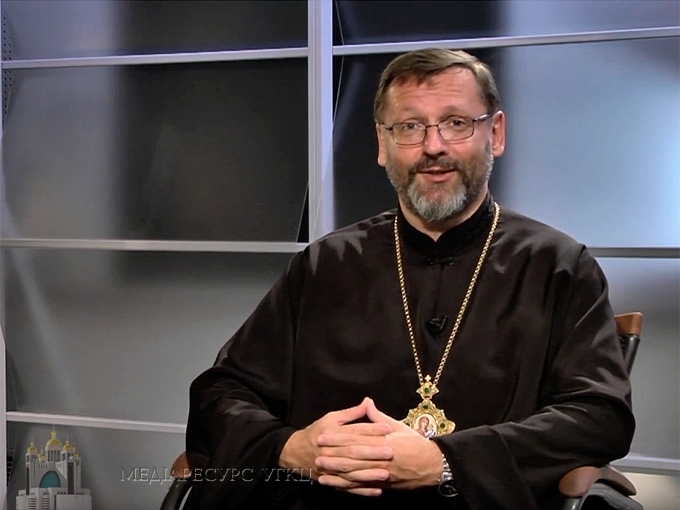 Head and Father of UGCC His Beatitude Sviatoslav in live project of “Zhyve TV” “Open Church” told about peculiarities of Ukrainian migration. Here are thirteen quotes we consider the most accurate which Head of Church gave during live program on 3rd of March. Emigration is an inevitable part of a modern global culture. A contemporary world is very dynamic: borders are falling down, so many modern means of communication exist, and not only ideas, inventions and bank transactions are moving swiftly, but people do so as well. Migration that waved away our Ukrainians caused UGCC to become global. At the end of XIX century, when our grandparents were leaving for South and North America they took their Church with them, spreading it all over the world. Our Church followed our people: our priests went where our people stayed, so to support them. Hence the Church has its own structures on every continent. Those people who live at the settlements and who are already became the descendants of our emigrants are a great power and huge blessing to our Church and people. Working foreigners soon become expatriates if they decide to stay in the country of their residence. Children often come to them and then a family reunites. That’s how a new life starts in a new country. Among those people that gather around our churches, our parishes abroad, I didn't see traitors of Ukraine. These are honest and indefatigable people who in the worthiest way represent the face of our country. The fate of a migrant worker is very uneasy and sometimes even dramatic. Our parishes, our communities often turn into the centers of social care and assistance to the people, who are trying to find themselves in a foreign country. A native land remains the one you were born in. Our people abroad who have passed the way of their formation, can be a reliance for a free and independent Ukraine. And free independent Ukraine, in turn, must respect these people who today are living around the globe and love their country dearly. The first waves of migration at the end of XIX century before the World War I, after the World War II, basically, were economic by nature. In other words, people left Ukraine, which didn’t give them an opportunity to survive. After the World War II there was a wave called political migration. People were forced to leave their land because of the new dominating totalitarian system. Those people didn’t want to go and, thus, were thrown away from their country. The latest migration after Soviet Union collapse is migrant workers’ migration. People were leaving for work, but nobody set a goal to leave Ukraine. Church observed such a phenomenon: migrant workers on their arrival from abroad need care and assistance so they may reintegrate into the society what they want to come back to. Ukrainian Church, Ukrainian community, Ukrainian school is a cell of preserving identity of Ukrainians abroad.